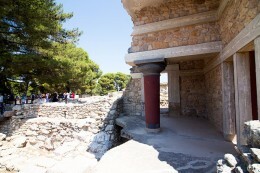 Knossos is located in a prominent position on the hill Kefalas, 6 km. southeast of Heraklion, surrounded by olive groves, vineyards and cypress trees. According to history, it was the seat of King Minos (considered as the son of Europe and Zeus) and at the same time the administrative and religious center of the region. 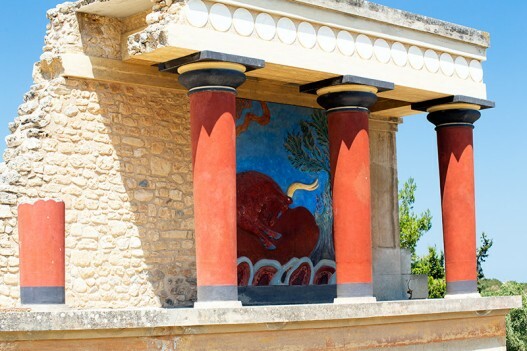 The popular and exciting myths of the Labyrinth of the Minotaur and Daedalus and Icarus are connected with the Minoan Palace of Knossos in Crete. 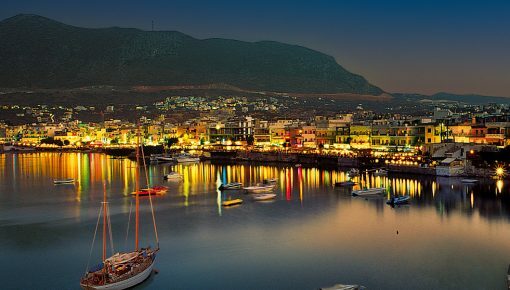 The heyday of the city dates back to the Minoan period (2000-1350 BC), when it was the main and most popular center of Crete. 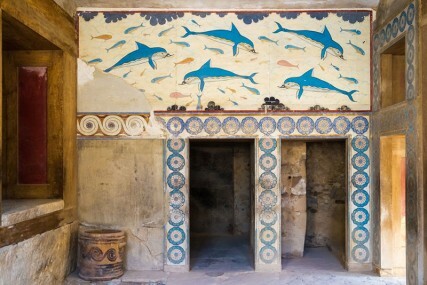 Knossos in Crete is the most important center of the Minoan civilization and one of the most magnificent of human history. 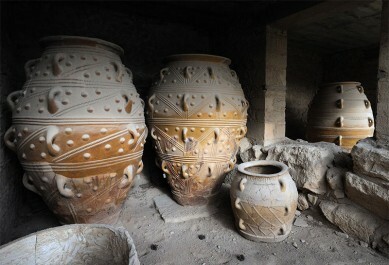 It is the largest and most distinctive Minoan archaeological site ever discovered in Crete. 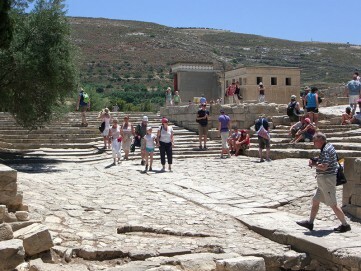 A visit at Knossos is one of the things you should do on Crete holidays. During excavations which lasted more than 30 years, starting in 1899, Sir Arthur Evans revealed the area of the palace. 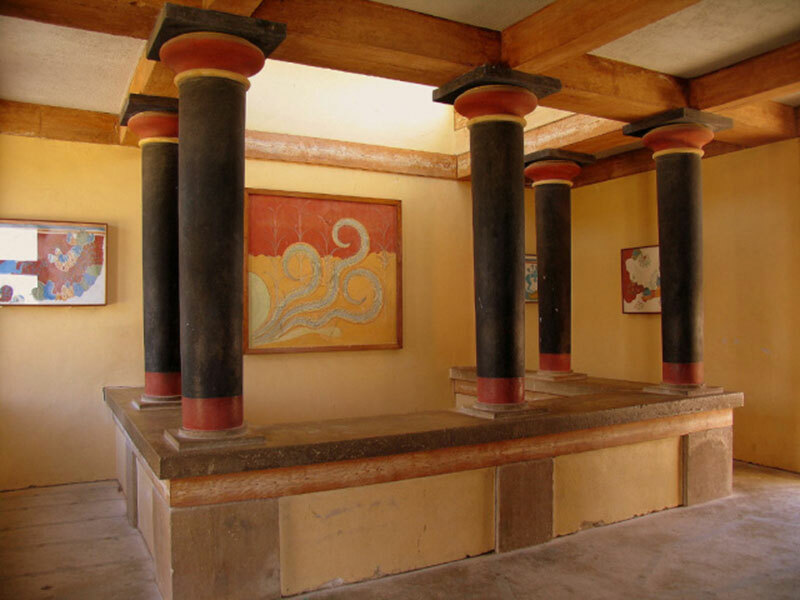 Its restoration is based on the evidence obtained from excavations and now the visitor is allowed to admire the architecture and elegance of this great Cretan palace. 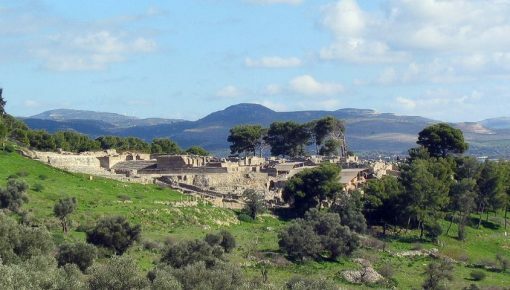 Further evidence of Minoan architecture has been found during the excavations at Phaistos and Malia. Minos was a legendary king of Crete, as during his reign, managed to create a remarkable civilization in Crete. When Zeus kidnapped Europe and brought her to Crete, under the sacred plane tree of Gortys, consummated her for three days continuously. From this union were born Minos and his other two brothers. When Minos grew up, he married Pasiphae and had four sons with her: Androgeo, Deucalion, Glafkos and Katreas, and three daughters, Akalli, Ariadne, Phaedra and Xenodiki. After the death of Asterios, who reigned in Crete until then, Minos claimed his throne. In order to prove that he was blessed by the gods to be a king, he made a sacrifice to Poseidon and asked him to show from the sea a white bull. He also promised that he would sacrifice the bull. However he was fascinated by the beauty of the animal and sacrificed another bull in its place. The Olympus god Poseidon, in order to punish him, made Pasiphae fall in love with the bull who is known as the bull of Crete. With the help of Daedalus, the architect of the Labyrinth in Knossos, Pasiphae got into a wooden construction, covered with leather, in order to look like a cow. 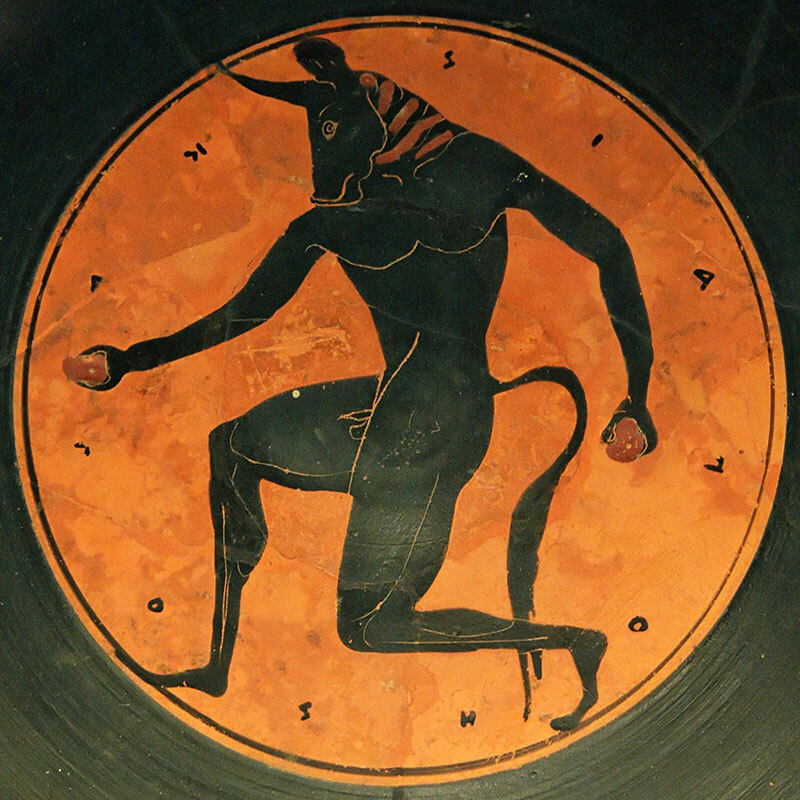 From the union of the bull and Pasiphae, Minotaur was born. When the Athenians killed the son of Minos, Androgeo, King Minos went mad and sworn that he will destroy them. The Athenians were afraid and willing to do anything he would ask from them. Minos punished them to send each year seven young men and seven young women to the Minotaur. Theseus, who was the son of the king of Athens, Aegeus, killed the Minotaur with the help of the daughter of Minos, Ariadne. 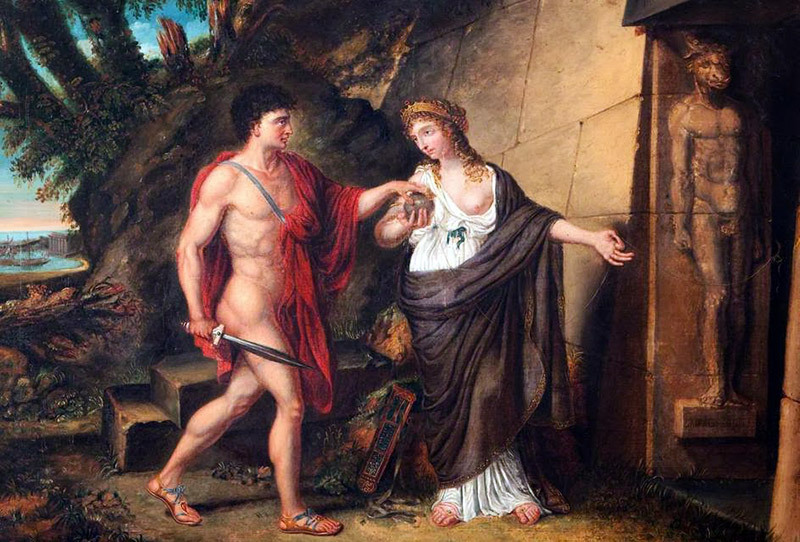 After the kill of Minotaur, Theseus left Crete along with Ariadne. Daedalus helped them. When Minos discovered the role of Daedalus in the escape of his daughter, ordered to throw him in the labyrinth along with his son, Icarus. Father and son were condemned to be buried alive. However, genius Daedalus found solution. Minos may have been king of the land and the sea, but we could not control the air. He made wings from feathers of birds for him and his son and pegged them on their shoulders with wax. 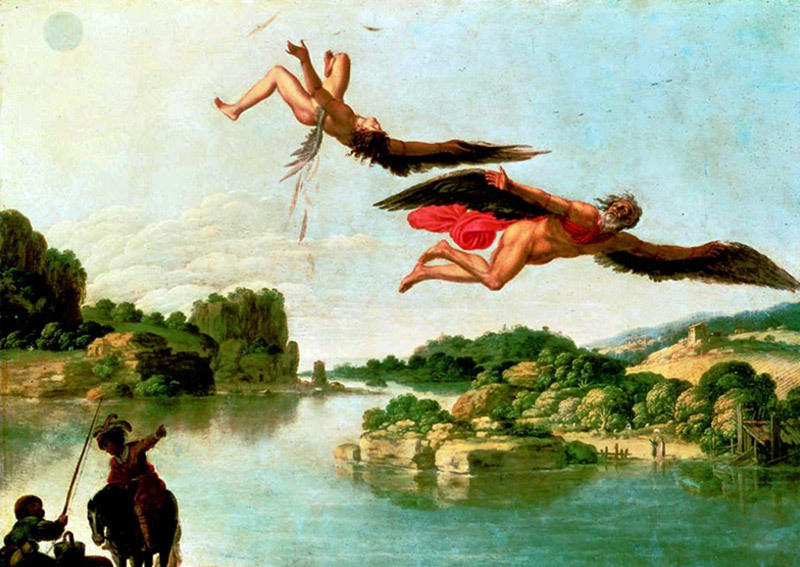 Daedalus advised his son not to fly too high, as the wax could melt by the sun. Icarus tempted to fly higher and higher. The wax that held the wings of Icarus began to melt. The unfortunate young man fell overboard and drowned. Overwhelmed Daedalus continued his flight over the sea which, since then is called the Icarian Sea. The palace tour starts from the western wing. In the background you can see the western facade of the palace. The west courtyard had a clearly sacred character, as we understand by the existence of two altars and is crossed by three processional corridors. Another processional corridor leads north to the theater and to the south on the west entrance. From there starts the corridor of the procession with the famous mural and ends in the south porch, which has two columns on each side. At left, a wide staircase leads to the renovated floor of the west wing. East of the staircase is the archaic Temple of Rhea. On the specific floor you will see warehouses. 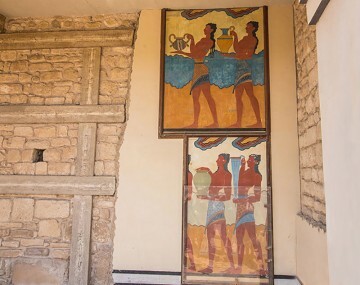 In a covered area on the first floor there are copies of murals from around the palace. From there, you descend the west staircase and go out to the central courtyard and the ceremonial area. 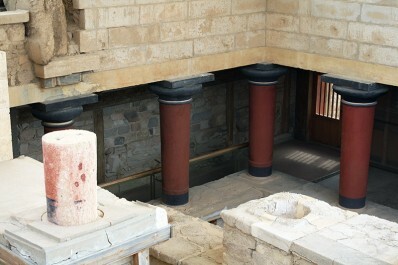 At your left is the throne room of King Minos. Crossing again the central courtyard, you will get on the east wing, opposite the tripartite / central sanctuary. At east, in the ground floor there is a corridor leading to the royal apartments. 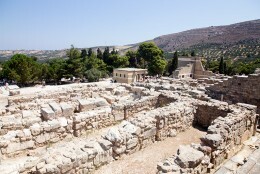 The royal apartments are saved in the “Mycenaean” form. Another corridor leads to the southwest, in “Queen’s Megaron”, which is smaller than the royal apartments, but more luxurious. Next, in the southeastern end of the palace, is the “Hall of double axes”, with lustral basin and pyramidal stone bases for the axes. The north side of the east wing includes potter workshops, while further is the “courtyard of the stone mouth” and the eastern entrance. Further north is preserved part of the old palace, the “warehouse with the big jars” and the “Northeast warehouses”. From this point a modern staircase leads to the “great eastern room,” the official Throne Room. Crossing the Northeast stores, you arrive at the north entrance known as “customs office” because here ended the way of the port. The ramp of the north entrance, surrounded with balconies, connected the “customs office” to the central courtyard. At right, there are six underground rooms known as “cells.” Northwest you will see the restored north lustral basin. 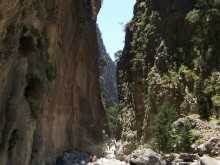 This point leads to the theater of the west courtyard and you can find the way out from the archaeological site. 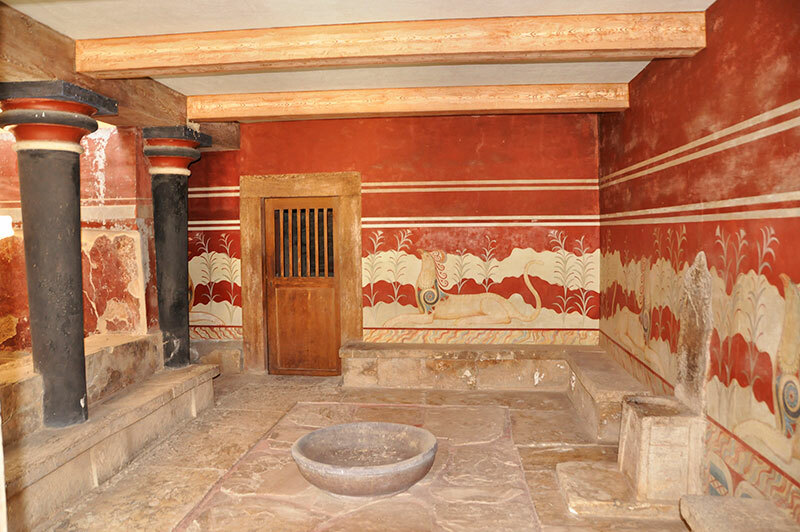 The archaeological site of Knossos in Crete is open from the 1st of April until the 31st of October, daily from 08:00 to 19.30 in the summer period. 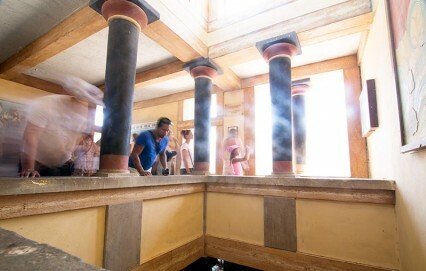 In the winter period it is open from the 1st of November until the 31st of March daily, from 08:30 to 15:00. Bring some water with you and don’t forget your hat and sunscreen. Especially during the summer months the sun is quite intense. During the summer months, there are usually long queues at the ticket offices. We suggest to start relatively early in the morning to reduce the waiting time at the entrance. In some places there are palace stairs, making a little rough the access for children’s trolleys. The consumption of food in the archaeological site is not allowed. 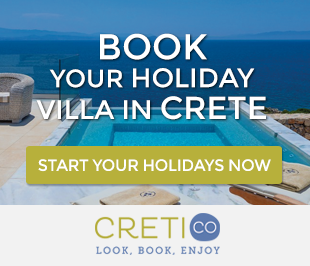 Posted on 03 Sep 2015 in Cretan Culture and tagged Archaeological Sites In Crete, Family Holidays In Crete, Heraklion Highlights, Knossos.